North-eastern Thai food reflects the influence of neighbouring Lao in a number of dishes. Glutinous rice is the staple diet, and all food is highly seasoned. This is supplemented by a heady mixture of strong bitterness and saltiness, creating an excitingly forthright taste locally known as saeb. Som Tam (green papaya salad), is one of north-eastern Thailand's favourite dishes that has became popular nation-wide, and even in Thai restaurants overseas. Amongst the many dishes that make up North-eastern Thai food. 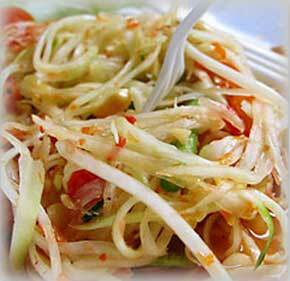 Som Tam (green papaya salad) has become a favourite and is popular nation-wide as well as in restaurants around the world. Som Tam is a spicy salad made from raw papaya, dried shrimp, crab, lime juice, garlic and chillies. For the genuine Isan version, Pla Ra, fermented fish, is also added to the dish. Lap (other popular North-eastern Thai food dishes include), North-eastern Thai food minced meat, chicken or pork, cooked in heavily seasoned dried chillies, lime juice and fish sauce; Nam Tok, medium rare barbecued meat cooked with spicy sauces, lime juice, fish sauce and dried chillies; and Kai Yang or grilled chicken, another North-eastern Thai food dish that is always ordered after the formula of Lap, Nam Tok and Som Tam. Bathed with herbs and sauces, it is eaten with a sweet sauce used as a dip.